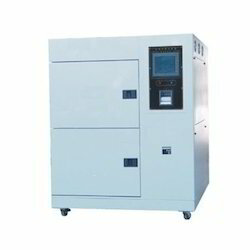 We are a leading Manufacturer of thermal shock chambers from Thane, India. Offered Thermal Shock Chambers are manufactured in accordance with industry standards by using quality-approved material procured from the authentic vendors of the market. Before the final dispatch to the customers, our experts examine these products on various parameters of quality.